Employees have a lot to manage every day. Is it any wonder that they sometimes forget to accurately record their arrival and departure times? The problem is that when an employee forgets, it is up to the manager or someone in HR to manually make changes. Our solution? Give employees the ability to edit their own attendance entries. This saves you time and gives you a more accurate picture of employee hours. Zoho People’s new employee regularization feature does just that. 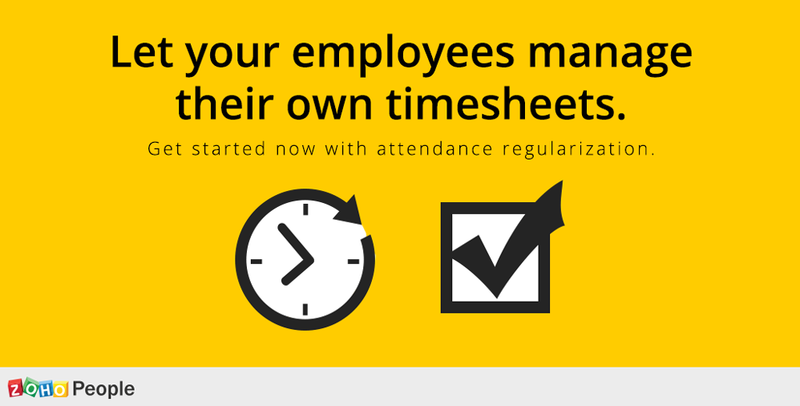 Start letting employees manage their own timesheets. Each changed entry can be set to send an email to the right manager, who can quickly decide to approve or reject the change. HR doesn’t have to spend time chasing down employees, and employees don’t have to manually alert their manager about the need for a change. It’s a win-win. With this automated attendance system, your organization can reduce costs and eliminate the manual, repetitive, and time consuming process of attendance management. No Replies on Drive your attendance management in an automated way. Commenting is Disabled on Drive your attendance management in an automated way.